Come and relax in a cozy condo rental at Kings Grant in North Myrtle Beach, South Carolina. Choose a two- or three-bedroom North Myrtle Beach condominium rental that is within walking distance of the Atlantic Ocean and also features great balcony views for your North Myrtle Beach vacation. The Kings Grant is in the Ocean Drive area of North Myrtle Beach, South Carolina. Kings Grant is located in North Myrtle Beach on 2nd Avenue North. These North Myrtle Beach condo rentals are only three short blocks away from the white sandy beaches of North Myrtle Beach, South Carolina. The Kings Grant condo rental building in North Myrtle Beach, SC is only three stories high. So no matter which wonderful North Myrtle Beach condo rental you choose it is only a few steps up a flight of stairs to your relaxing retreat. There is also an elevator for your easy convince to access your North Myrtle Beach condo rental in South Carolina. You will be able to choose to have your car covered and out of the sun in the covered parking or park in the courtyard parking very close to your condo while you stay at a Kings Grant condo in North Myrtle Beach. 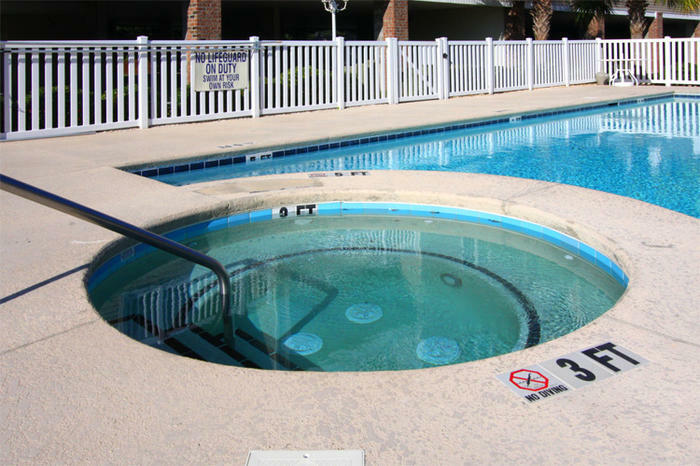 There is a beautiful sparking outdoor swimming pool for you and your family to enjoy at Kings Grant in North Myrtle Beach, South Carolina. Take some time to lounge in or around this peaceful swimming pool after a fun filled day on the ocean. Or soak your body in the outdoor Jacuzzi tub after a busy day of shopping or sightseeing in North Myrtle Beach, South Carolina. You can enjoy a book or just soak up the sun on the peaceful sun deck during your North Myrtle Beach vacation in South Carolina. Do not forget a cold glass of sweet tea to keep you refreshed while out in the sun at the Kings Grant condos in North Myrtle Beach. You and your family will be most comfortable when you choose a two- or three-bedroom condo at Kings Grant in North Myrtle Beach, South Carolina. These North Myrtle Beach vacation rentals are very spacious and unbelievably comfortable. Bring up to six of your closest family members or friends to stay with you at Kings Grant condominium in North Myrtle Beach. During your North Myrtle Beach vacation your stay at a Kings Grant rental will provide you and your family with a fully furnished and spacious kitchen with modern appliances to use. Your family will be able to share two bathrooms and have your own washing machine and clothes dryer in your condo rental during your stay at North Myrtle Beach. Elliott Beach Rentals is not affiliated with onsite management or the HOA of Kings Grant.